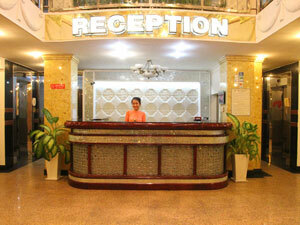 Welcome to Thien Tung Hotel! Best rate guarantee - Thien Tung HotelThien Tung Hotel is located right in the heart of the city which places it close to the shopping, sightseeing and the entertainment areas of the city. From the hotel it is just a 2 minute walk to the well known Ben Thanh market which is a must see for the visitor. From the Tan Son Nhat airport to the hotel is just a 20 minute drive. Thien Tung Hotel has 80 well equipped rooms that have Asian style rattan-ware mixed with an old-style western world motif. In addition to the normal amenities that one expects to find each room comes equipped with air-conditioning, refrigerator, mini-bar, IDD telephone, satellite TV and wifi access. Located on the rooftop is our restaurant the serves a complimentary buffet breakfast. In addition the hotel has a swimming pool and gym. This hotel is the ideal location for a visitor to relax after a day of work or just enjoying the sights. Descriptions: Rooms with complimented with first - class facilities such as Asia style rattan - wares mixed with old - style western wooden furniture, air conditioners, refrigerator, IDD telephone, color TV with satellite, personal safe, table and fully equipped bathroom. Restaurant at Thien Tung Hotel is an ideal place for guests to taste many different Western and Asian dishes or drink coffee, cocktail, wine... while listening to the soft music.